Up until a few months ago, the best way to ruin a developer pc was to install IE7. As much as developers and web designers want the world to move away from IE6, there are still lots of machines that still run it. These computers are typically in enterprise environments, where staff are prohibited from upgrading their browser and some in-house applications would stop working if they did. I recently worked in an environment like this. In the old days (back when all you could see was farmland for miles around), it was easy to load several versions of Netscape and run them concurrently. I used to be able to code a web page and tell you how it looked in Netscape 3, Netscape 4, Firefox, and . . . whatever version of IE I had installed. Because there was no way to install multiple IE versions, you pretty much had to stick with the lowest common denominatorâotherwise, there was no way to tell what your site would look like to the luddites. It was possible to run different browser version in different virtual machines, but this was really tough on a slow pc. Some developers donât bother checking their code in other browsers at allâespecially in a corporate environment, but I encourage it anyway. A few months ago, Microsoft released the Expressions Superpreview application which renders your pages in IE6 and IE7 in a side-by-side comparison. This really makes life a lot easier. While working on some changes for the Overpass site, I was able to view my site in Firefox, Safari, and IE8 on my workstationâand in IE6 and IE7 with Superpreview. I found that my transparent PNG files were not transparent in IE6 and was able to correct this. 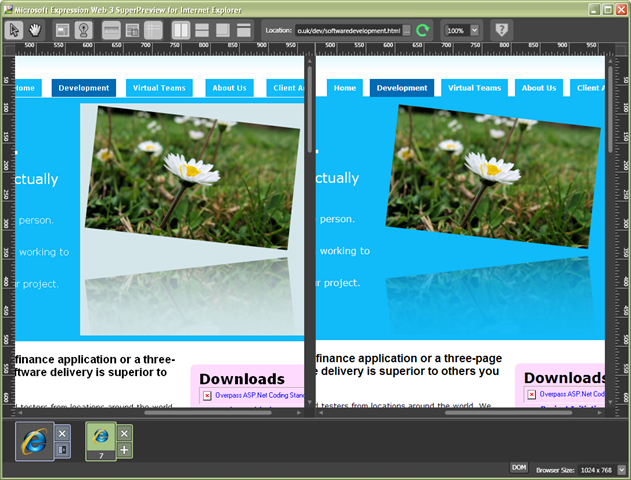 Superpreview is one of those tools that would have come in handy so many times in the past. If you do cross-browser design, you should have a look at it. 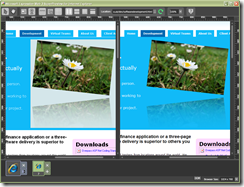 The Superpreview application can be downloaded here. And about the transparent png problem I had (in case you found this post while Googling the issue) . . . I spent most of the morning and part of yesterday trying to get my transparent png files working. They worked on the local PC, but not from the server. I spent ages Googling problems with PNG and Ubuntu, PNG and Apache, etc, but couldnât find the problem. In the end, I found that the problem I first had was due to the fact that I was uploading the images as ASCII instead of binary. To fix the problem with png transparency rendering in IE6, I used a fantastic script written by Drew Diller called DD_belatedPNG which renders PNG files as VML. That script can be found here. What a huge help it was.